BHOPAL: Sultan Jahan Begum, Begum of Bhopal (1858-1930). bl.uk > Online Gallery Home	> Online exhibitions	> Asia, Pacific and Africa Collections	> BHOPAL: Sultan Jahan Begum, Begum of Bhopal (1858-1930). 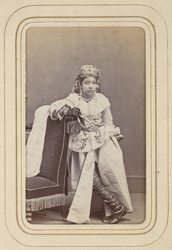 Full-length standing carte-de-visite portrait of Sultan Jahan Begum (1858–1930) in ceremonial dress taken in the early 1870s by Bourne & Shepherd from the 'Album of cartes de visite portraits of Indian rulers and notables'. Bhopal was unique among the princely states in that it was ruled by a succession of widows. Sultan Jahan Begum succeded her mother Shah-Jahan Begum in 1901. Sultan Jahan Begum was a reformer and did much to advance the position of women and education in Bhopal. Though her main legacy is public health, by adopting widespread inoculation and vaccination, improving sanitation, hygiene and the water supply. In 1904 she recieved the Grand Commander of the Indian Empire and the Grand Commander of the Star of India in 1910. She abdicated in favour of her son in 1926.